Europe is the only region projected to see a decline in its total population between 2010 and 2050. Although Christians will continue to be the largest religious group in the region, Europe’s Christian population is expected to drop by about 100 million people, falling from 553 million in 2010 to 454 million in 2050.58 Europe’s Jewish population also is expected to shrink, from 1.4 million in 2010 to 1.2 million in 2050. The remaining religious groups in Europe are projected to grow in number due to a combination of higher fertility, younger populations and net gains via migration and religious switching. Europe’s Muslim population is projected to increase by 63%, growing from 43 million in 2010 to 71 million in 2050. 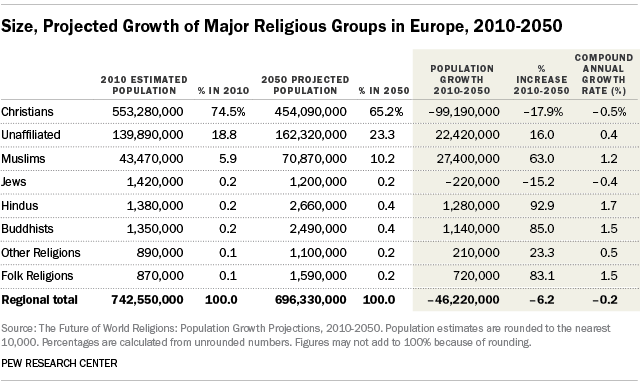 The religiously unaffiliated population in Europe is expected to grow by about 16%, from 140 million in 2010 to 162 million in 2050. Hindus, Buddhists, members of folk religions and members of other religions in Europe are expected to experience large gains relative to their 2010 population size, but none of these groups is forecast to exceed 3 million people in 2050. In 2010, there were roughly equal counts of Jews, Hindus and Buddhists in the region (1.4 million each), but by 2050, the Jewish population (1.2 million) is expected to be about half the size of both the Hindu (2.7 million) and Buddhist (2.5 million) populations. The decline in the size of Europe’s Christian population will result in Christians decreasing as a share of all Europeans (from 75% in 2010 to 65% in 2050). By contrast, the share of Europe’s population with no religious affiliation is projected to increase from 19% in 2010 to 23% in 2050, and the Muslim share of Europe’s population is expected to nearly double, from less than 6% in 2010 to more than 10% in 2050. 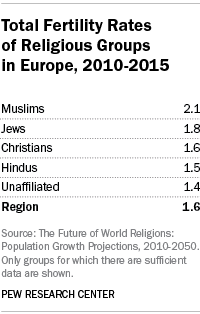 Europe’s Muslim population has higher fertility than other religious groups in the region. The Total Fertility Rate of Muslims in Europe is 2.1 children per woman in the 2010 to 2015 period. Other religious groups have fertility rates below replacement level, including Jews (1.8), Christians (1.6), Hindus (1.5) and the religiously unaffiliated (1.4). The low fertility rate in Europe as a whole (1.6) is largely responsible for the projected decline in the region’s total population. 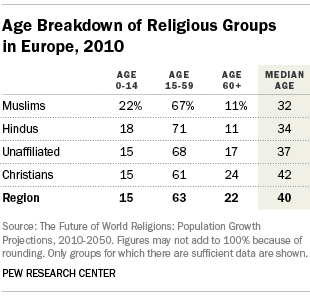 The religious groups projected to experience growth in Europe in the decades ahead tended to have younger populations in 2010 than the Christian majority. The median ages of Muslims (32), Hindus (34) and the religiously unaffiliated (37), for example, were younger than the regional median age (40) and the median age of Christians (42). The religiously unaffiliated population in Europe is expected to grow because of high levels of religious switching, largely from Christianity. (For information on the impact of religious switching on the demographic projections, see Chapter 1.) Without religious switching, the unaffiliated share of the population would be expected to remain about the same in 2050 as it was in 2010 (19%). Taking into account projected patterns of religious switching, however, the unaffiliated share of Europe’s population is expected to increase to 23% by mid-century. 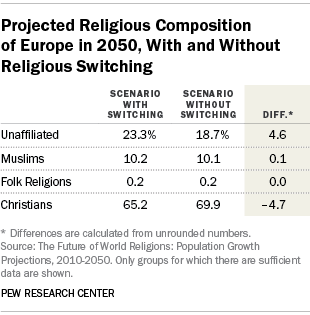 In a projection with no religious switching, the Christian share of Europe’s population would be forecast to decline from 75% in 2010 to 70% in 2050. Because of expected religious switching, however, the Christian share of the population is expected to decline even further, to 65% in 2050. Migration is expected to alter the religious landscape of Europe in future decades. (For information on the impact of migration on the demographic projections, see Chapter 1.) In a projection with no migration, the Muslim share of Europe’s population would be expected to grow from 6% in 2010 to 8% in 2050. 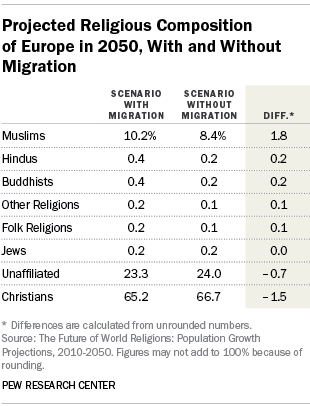 When expected migration is factored in, the Muslim share of the population forecast in 2050 rises to 10%. As migration from Asia to Europe continues, Hindus, Buddhists and adherents of folk religions and other religions all are expected to increase slightly as a share of the European population. By contrast, migration is expected to decrease the share of the region’s population that is Christian or unaffiliated.